I like that Garparro's Meat Market's business cards can just say "Vince, Nick & Pat". 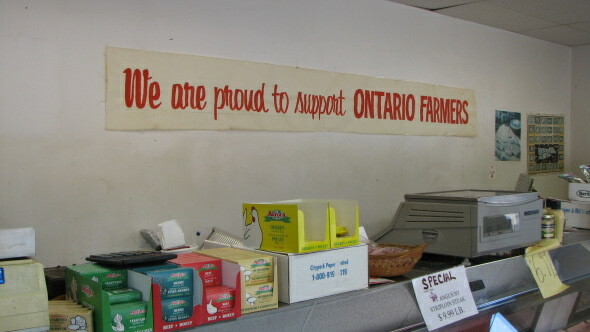 The family-owned butcher on Bloor St. West has been around for 18 years now. 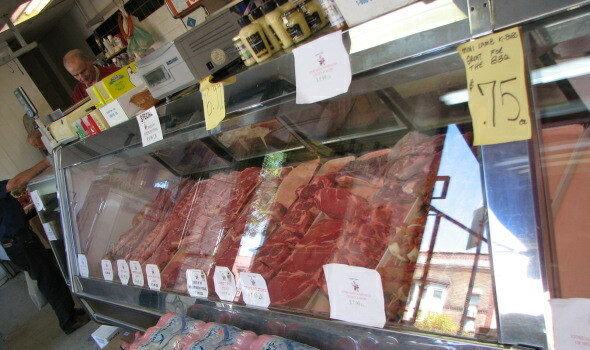 And a small family-owned meat shopping experience is what you'll get here. The shop itself is quite small and the prices didn't stand out as particularly cheap, but I wasn't about to hold that against them just yet. Nothing irks me more than visiting a butcher that isn't receptive to answering questions about their product and helping out with making a selection. Thankfully, this was not a problem when visiting Gasparro's. Pat was more than willing to discuss where the meat comes from, make a few recommendations, and even share a recipe for roasting a whole chicken. They make it no secret that their poultry is their premier product. The chicken is all "free-run", at reasonable prices. $2.79/lb for a whole chicken and $4.99/lb for boneless breasts. In my short visit I even witnessed a few testimonials to their highly regarded chicken kabobs. Chicken aside, there is more to speak of. They claim that all their lamb is sourced from a local farmer who is a friend of the family and sells his lamb exclusively to them. Always nice to hear. I didn't get a chance to try it but their lamb sausage at $4.99/lb looked like a good buy. Most (pleasantly) surprising, was a find in their beef selection that made me do a double take. Grass-fed t-bone and rib eye steaks for $7.99/lb! Asterisk: they are from "small animals" (veal). When I asked about why they have only these two grass-fed cuts, they didn't seem to think too much of it, saying one of their suppliers hooks them up. In fact, they are talking to another farmer who might be able to supply a full line of grass-fed beef. Selection is relatively small so I wouldn't trek across the city for a visit, but for a local butcher it might be just what you're looking for.